When it comes to fruits, it always seems like pomegranates are a trouble. They are messy with their seeds, sometimes you can’t even take out all the seeds, which are essential in this fruit, and the only eatable thing. It also leaves stains everywhere. Considering they are a kind of berry, everyone would rather choose some strawberries. It seems like there are more cons then pros with them. But the thing is, they are an extremely healthy kind of berry. Although it’s proved that it’s like strawberries – rich in vitamin C and fiber, antioxidants, and with anti-inflammatory properties, pomegranates can also help protect from some diseases, such as Alzheimer’s and certain cancers. Pomegranates come from Iran and northern India. They can be traced back to 3000 B.C. when the ancient Egyptians were using them. Some even think that it wasn’t an apple, but pomegranate that Eve was tempted by. Nowadays, pomegranate is popular on the West. More and more people become aware of its benefits, and decide not to pay attention to the mess it leaves behind. Also, you can simply search YouTube tutorials to find out how you can easily cut it. Those antioxidants above prevent some kidney and cardiovascular diseases (such as high blood pressure), and dialysis-related infections. In a study, during the annual meeting of the American Society of Nephrology in 2010, it was found that pomegranate juice is rich in potassium. It can reduce many of the dialysis-related complications for kidney patients. It also showed a reduced morbidity rate. The vitamin C in its seeds makes nearly 40% of the daily recommended amount. They also lower blood pressure and are rich in fiber, which means they satiate hunger. If you aren’t into just eating the seeds, you can put them in your oatmeal, quinoa or yogurt. You can even top chicken and turkey dishes with them. Scientists from Queen Margaret University in Edinburgh conducted a research which involved 58 volunteers aged between 21 and 64. Known as viagra fruit, it was discovered that drinking pomegranate juice daily enhances libido in both men and women, due to testosterone. One more on the list of good news – pomegranate juice prevents dental plaque microorganisms. The Ancient Science of Life published a research in which they claim that pomegranate juice reduces plaque-forming units by 32%. This is due to antioxidants polyphenols in it, which have antibacterial properties. In a study conducted by the University of California, Riverside, it was found that components from pomegranate juice are good for stopping prostate cancer cells from moving. They also weaken the chemical signals that promote this kind of cancer to spread in the first place. Israeli researches found in another study that it can also prevent and destroy breast cancer cells. It was also found in the study from the University of California, Los Angeles, that patients with prostate cancer may experience lowered levels of a prostate-specific antigen (PSA) when they drink 8 ounces of pomegranate juice each day. PSA is a protein produced by cells of the prostate gland. Even though there are normal or abnormal levels of it, studies show that men with levels below 4.0 have prostate cancer, whereas men with high levels don’t. 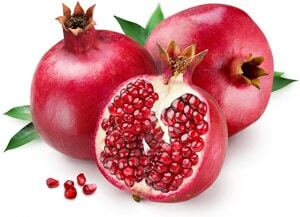 It is believed that punicalagin is the source of pomegranate’s anti-inflammatory properties. This is a polyphenol. In one animal study, mice were fed with pomegranate juice, and it was discovered it lowered levels of amyloid plaque and improved their performance for certain mental tasks. Amyloid plaque is the plaque that accumulates between the brain’s nerve cells, the hallmark sign of Alzheimer’s. If you decide to skip the fruit and go right to the juice, pay attention to which brand you’re buying. Evolution Slimming Pomegranate Extract is a good choice, considering it consists no added sugar, it’s far healthier than juice. It manufactured from the finest quality standardized extract in the UK. Evolution Slimming Pomegranate is 100% pomegranate. 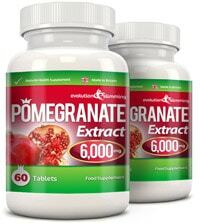 It contains 40% Ellagic Acid per tablet , that is 8x more than an average sized glass of pomegranate juice. It is rich in antioxidants more than grape, blueberry, and orange juices. It is superior compared even to green teas and wine. Thumbs up!